REVIEW – A few years ago I went to take our Yorkshire Terrier outside one last time before going to bed. I was tired and feeling a bit lazy, so I didn’t bother putting a leash on her. Normally our dog isn’t a runaway kind of dog, but that night there was a deer in the front yard. Like a flash our dog went after it—yes, our little dog has a Napolean complex—and the deer took off. She circled our house once and then bolted for the woods with our Yorkie in hot pursuit. In less than 15 seconds from the time I had opened the front door, our dog was gone. This story does have a happy ending. After searching through the forest for 30 minutes, our daughter stumbled upon our dog and brought her home. We were lucky that night, but maybe it’s better not to reply upon luck. If you have a dog with a proclivity for running away or chasing the wildlife, Mishiko has a tracker that can help you find your missing canine companion. Mishiko Dog GPS & Fitness Tracker is a gadget designed for two purposes. 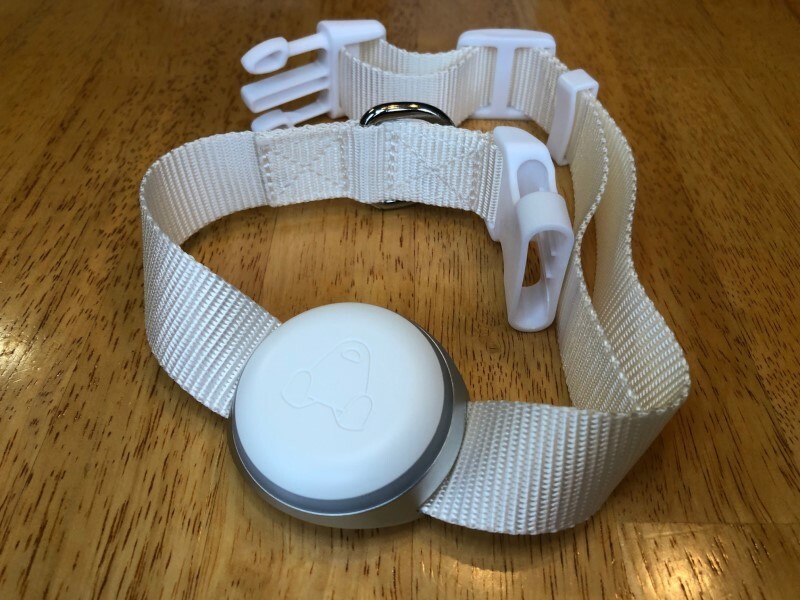 One, it can help you find your dog when she runs away; two, it can track your dog’s activity levels to make sure she’s getting enough exercise. 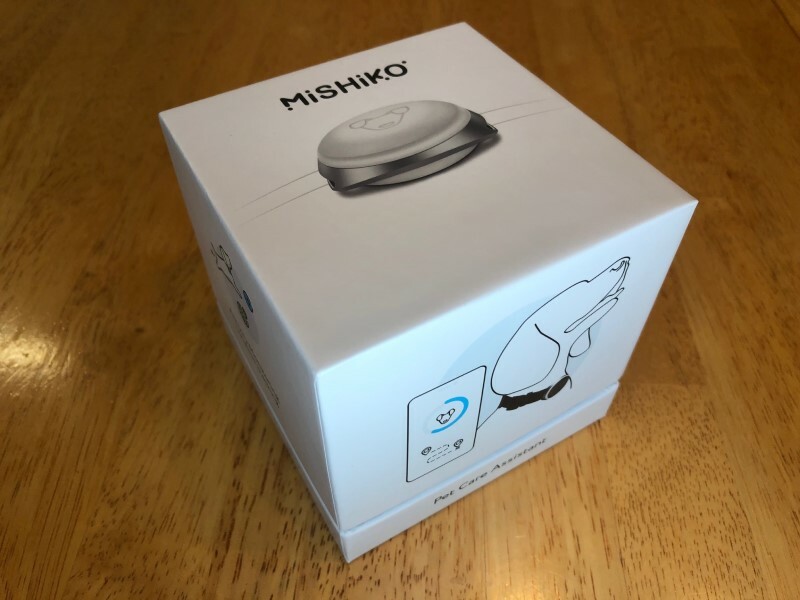 Mishiko says that their tracker is designed for medium and large dogs and for good reason. At 2 inches wide and 0.75 inches tall, the puck-shaped device is not exactly small. When attached to the collar, it overwhelms our little Terrier but is perfect for our neighbor’s Golden Retriever. The tracker is powered by a rechargeable battery. The Mishiko website says that it takes about 3 hours to charge and should last for a day or two. The battery can only be replaced by Mishiko service center specialists. As its name implies, the Mishiko tracker has a GPS receiver that can collect geolocation and time information from both GPS and GLONASS satellites. When used together, a GPS receiver can fix its position anywhere in the world to within 6 feet. The Mishiko website, however, says their device, when conditions are good, is at best accurate up to 13 feet and at worst 164 feet. One limitation for any GPS device is that it requires an unobstructed line of sight to the satellites. If your dog is in a mountainous area or downtown among tall buildings, then the conditions could be poor and the GPS receiver might not work very well; in fact, the Mishiko website says that it could be off by as much as 3200 feet. Just as a point of reference, a football field is only 360 feet long, if you include the end zones. The tracker also contains a cellular device that communicates using 2G and 3G networks. If you’re out in the boonies where there’s no cell phone coverage, then it won’t be able to transmit its location back to you. 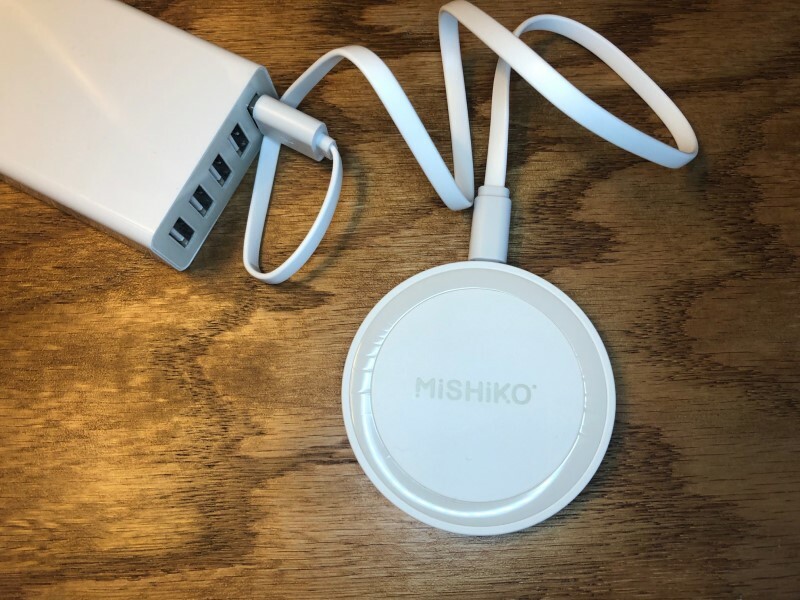 This built-in cellular capability is what the Mishiko device uses to automatically check for and download software updates whenever it is charging. The device is rated IP67, which means that it can be immersed in water up to 3 feet deep for up to 30 minutes. In other words, it should be just fine if your dog jumps into the pool or the lake while wearing the tracker. The Mishiko Dog Tracker comes in a beautifully stylish little white box. The top slides up and off, revealing a blue interior that highlights the tracker already attacked to a collar. My tracker and collar were both white; they are also available in black. The battery in the tracker does not come pre-charged, so the first thing to do is to set up the wireless charging station. It comes with a USB cable for charging, which I plugged into my Anker USB charger. As advertised, it took about 3 hours to charge. 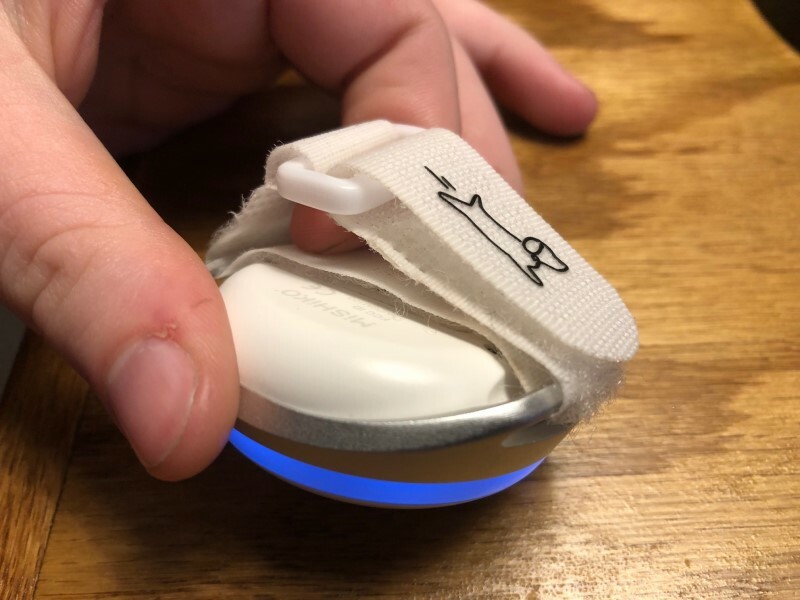 The tracker has a built-in white light that goes all the way around its circumference. When charging begins, only a small part of this ring is lit; when finished, the entire ring is lit. As a side note, when fully charged this light is surprisingly bright; one night I woke up, saw the light from my bedroom, and thought I had left a lamp on. It’s a bit much for around the house—we started calling our dog “Lightbulb” whenever she had the tracker on—but I suppose if your dog ran away at night, it could be very helpful for finding her. The next step is to download the Mishiko app. The quick start guide conveniently includes a couple of QR codes, one for Apple’s store and one for Google’s. As I have an iPhone, I simply took a picture of the correct code, and it took me to the App Store for downloading. So easy! Once the app is downloaded, the registration process begins. First, I created an account. This requires an email for the username and a password of your choice. Second, I entered some information about our dog, its breed, age, weight, height, gender, etc. and took her picture. Although I am only tracking one dog, if you buy multiple trackers, you can track them all in the app with the same account. Third, I entered the serial number and password associated with the device, which uniquely identifies it. This info is helpfully found in the quick start guide, the user manual, and on the tracker itself. Mishiko made sure that you won’t lose this info, without which the tracker isn’t of much use. Registration was quick and painless! Once the tracker finished charging, it was time to attach it to the dog. 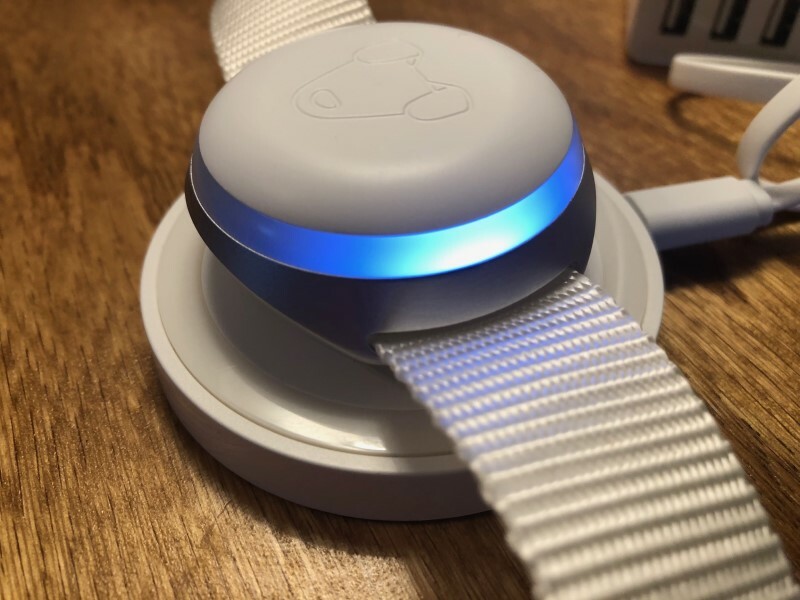 If you want, you can use the collar that comes with the device. It’s made of nylon and has plastic clips that are functional. The collar is quite long (27 inches), and for anything smaller than a Saint Bernard you’ll probably want to trim off some of the excess. Keep in mind that if you want to use Mishiko’s collar, you’ll need to take off every night or two in order to charge it. On the other hand, if your dog already has a collar that you like, you can use the universal fastener to clip on the tracker. I’m glad Mishiko added this little feature, because it makes it easy to take the device on and off. The Mishiko tracker has two main features: keeping track of your dog and keeping her healthy. 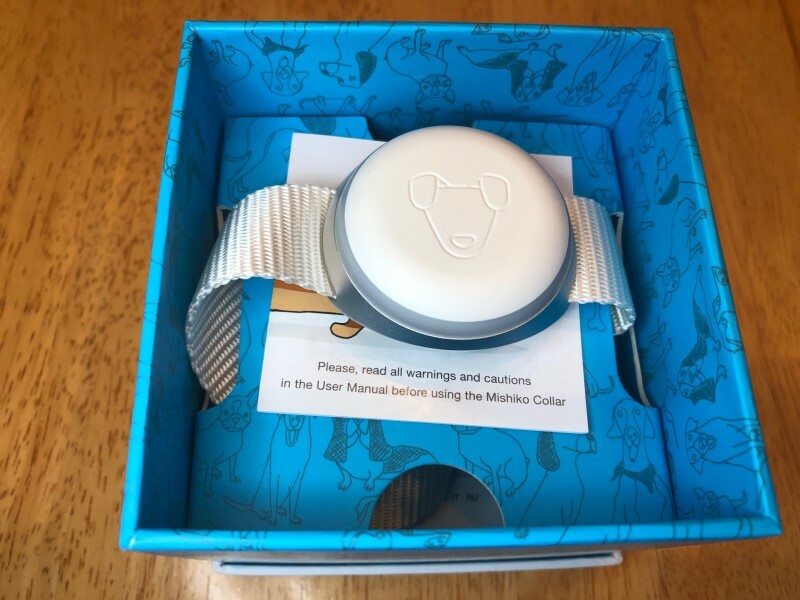 If you have a dog that likes to run away, or if you have a new dog that you’re unsure about, the Mishiko tracker can be used to help you keep track of your dog’s location. 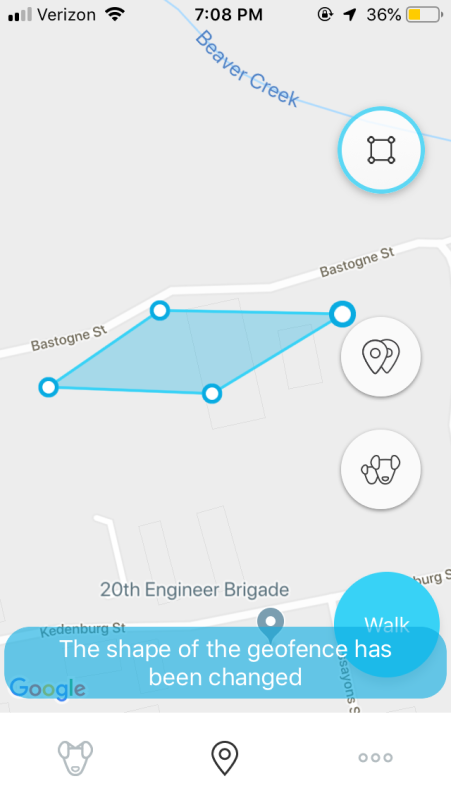 The first feature that the tracker offers is a geofence. You find your house on the map and drop a geofence upon it. The default shape is a square, but you can manipulate the four corners to make any four-sided shape that you want. 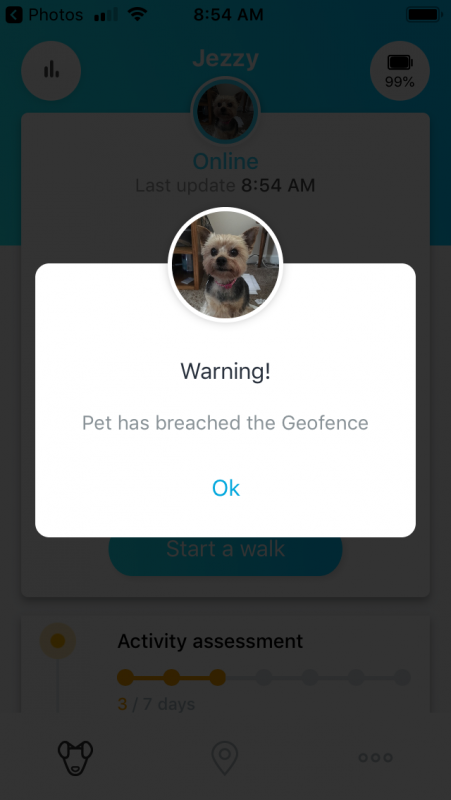 Whenever your dog leaves the geofence, the Mishiko app sends a notification warning you that your pet has breached the geofence. The default size of the square is about 500 by 500 feet. On our street, this square is large enough to cover not only our yard but five additional yards in both directions; in other words, it’s a huge geofence. Shortly after setting up a default-sized geofence, I got an alert. Our Yorkie had already run away! Then I looked down and saw that she was sleeping on her bed right next to me. Unfortunately, this was not the only false alarm that I got. Every day I get a few more alerts, and every time the dog is right where she belongs. This feature is a bit like the boy who cried wolf; it has happened so often that I simply ignore it. To make matters worse, it’s just as error prone the other way around. In other words, when I intentionally took the dog on a walk outside of the geofence, sometimes I got an alert, but other times I did not. There seems to be about a 50-50 chance that the app will tell me that my dog has run away. Sadly, I think the geofence feature is simply too unreliable to be of any use, which is too bad, because it’s a great idea. The second feature that the tracker offers is the ability to find your dog once she runs away. Since our dog doesn’t really run away—we couldn’t find a deer to help us out—we had to “help” her run away. My wife put the dog in the car and drove off without telling me where in the neighborhood she was going. I waited several minutes for the geofence alert to warn me, but sadly it never did. Finally, I just turned the app on and looked at the map; indeed, my dog was no longer near our house. I hopped into my car and set out to find her. The good news is that this functioned exactly as intended. Although the app doesn’t give directions like Google Maps—turn left on Main St—it perfectly overlaid both my position and the dog’s position on the map. All I had to do was keep my icon moving towards my dog’s icon, and eventually, I found her. Given Mishiko’s statements about how inaccurate the GPS might be, I was a bit concerned that the app would get me only sorta close to my dog but not really close. I’m happy to report that this wasn’t the case; it was accurate to within a few feet. After finding the dog in our neighborhood, my wife drove off again and took the dog out of our neighborhood. I waited a bit and then tried to find her. Even though she was a few miles away, the app had no problem leading me right to her, to the dog, and (conveniently) to a Starbucks. This is really good to know: If your dog runs away, the Mishiko tracker can take you right to her. 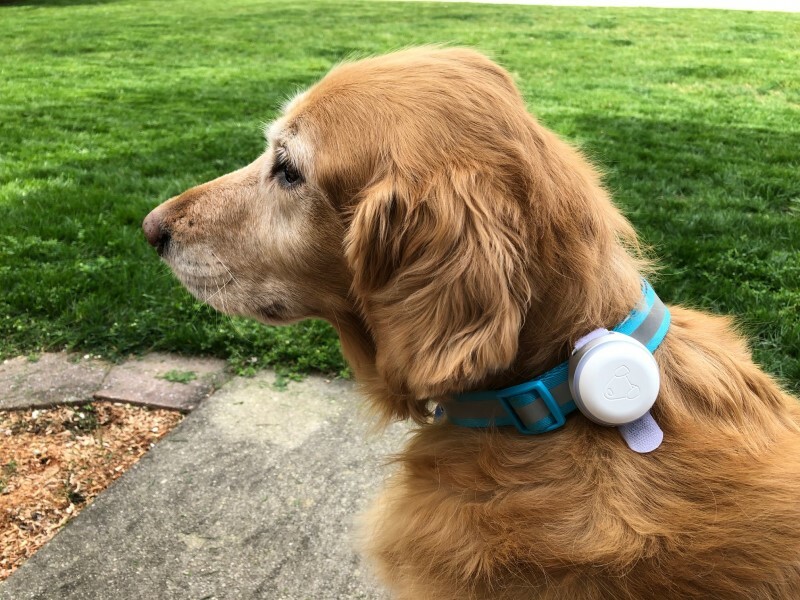 The Mishiko tracker can be helpful if your dog runs away, but it’s also useful even if she never leaves your neighborhood. It can track the health of your dog, ensure that she’s getting enough exercise, and give you some hints about diet. It’s kind of like a Fitbit for dogs. When I began using the app, one of the first things I did was run an assessment. It’s a week-long evaluation of your dog and how much exercise she’s getting. When finished, the app gives a diagnosis. 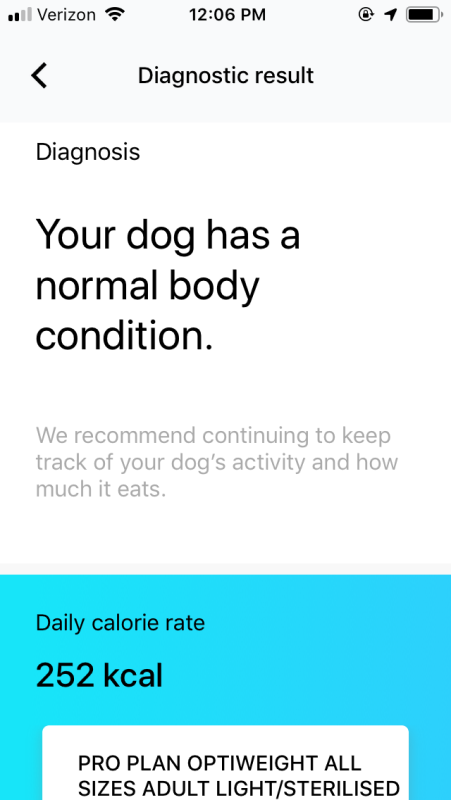 For my dog, the diagnosis was “Your dog has a normal body condition.” Based on this diagnosis, the app helps you to keep your dog healthy in two ways. It’s worth noting that the manual says the app works best for dogs that are one year or older, so if you have a puppy, it might be a bit off. The first way the app keeps your dog healthy is by making sure that she gets enough exercise. 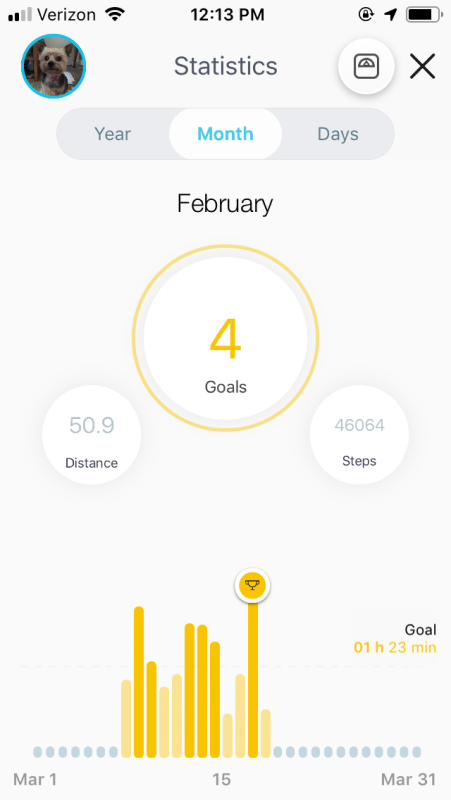 The tracker and the app measure how much exercise your dog has already had each day and how much more she needs to get (or stay) healthy. 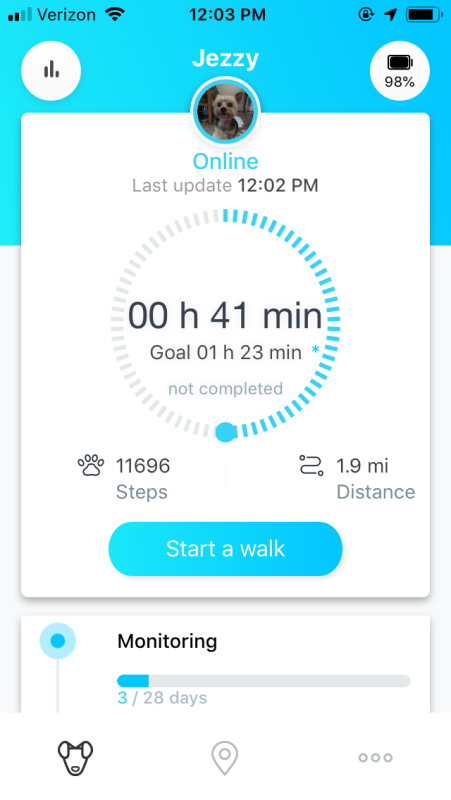 You can press the “Start a walk” button, and it will track your path, the number of steps taken, the distance walked, and the total time of your walk. In fact, this app keeps track of a lot of statistics about your dog, which you can find on the Statistics page. It’s quite fabulous, except for one detail: Its measurements are sometimes wildly inaccurate. 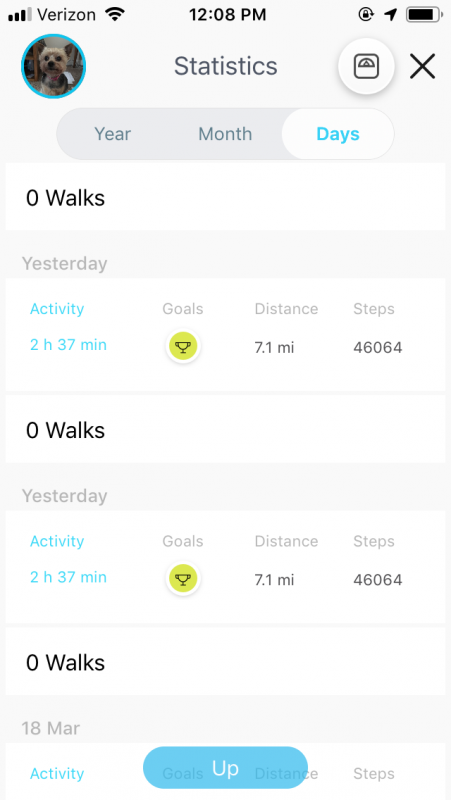 If you look at this next screenshot, you’ll see that it says that our dog walked 7.1 miles yesterday. The problem? Our dog never left the house that day, except when she had to “go” outside. We didn’t take her for a walk that day; we didn’t even play fetch with her. (We were pretty bad owners that day, weren’t we?) Did she walk 7.1 miles? Not a chance. It’s unlikely she even walked half a mile. There are lot of days when the statistics showed wonky values like this. 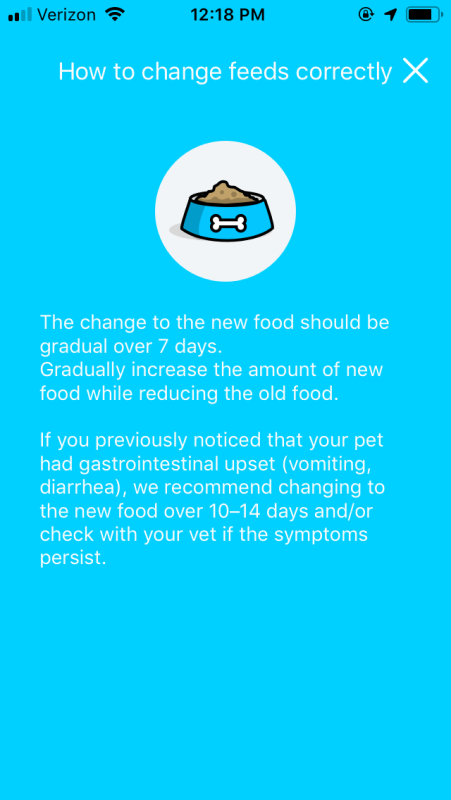 The second way the app keeps your dog healthy is by recommending good dog food to eat. Some dog food is healthier than others, so if you enter the type of food that your dog is eating now, it can recommend better food. Unfortunately, this part of the app looks like it’s not quite done. It only recognizes a very limited set of manufacturers. We use Hill’s Science Diet, a very popular brand and one recommended by our vet, yet the app didn’t recognize it and recommended that we switch. Given the links to buying food from within the app, it feels more like a way for Mishiko to make a little extra money than it does a source of great recommendations. On the other hand, there is some useful information here. For example, it teaches you how to gradually change from an old dog food to a new one, something that is especially helpful for dogs with sensitive stomachs. Overall the app looks nice; the interface is simple and intuitive. There are, however, a few wrinkles that still need to be ironed out. If you look back at the screenshot for the Statistics page above, you’ll see that “yesterday” is listed twice; every day is listed twice. If you look at the monthly view below, you’ll see that it says February at the top, even though it’s actually March (and even says March on the bottom). These aren’t critical bugs, but they seem like mistakes that should have already been caught by their software testing process. 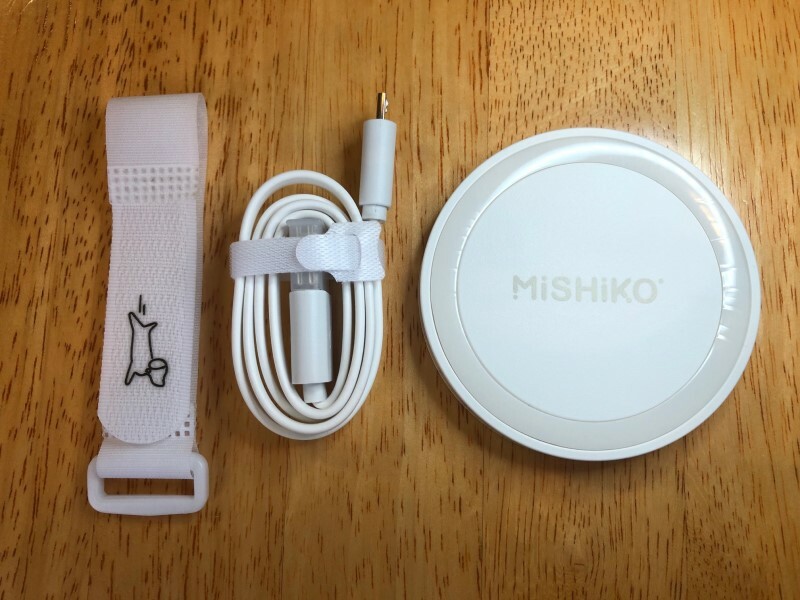 The Mishiko Pet Dog GPS Tracker leaves me conflicted. On the one hand, I think the primary value of this device is to find your dog when she runs away, and it does this very well. On the other hand, there are several things that just aren’t working right. This gadget has a lot of potential, but for most people, I recommend waiting a bit to see Mishiko can fix the problems. If, however, your dog likes to run away, and you’re concerned about losing her, then it’s probably worth buying. Price: The basic option is £49.99 (~$67) plus £4.49 (~$6) per month after the first month. Other options are also available. Source: The sample for this review was provided by Mishiko. I refuse to trust any of those dog trackers after one of them sent me an alert while I was at work that my dog was “outside the home area” and placed his location on a street with the local park (aka exactly where he’d head if he got out). I panicked, drove home…and found the dog snoozing quietly on the couch. All while the app was happily indicating he was wandering my town. I’m pretty sure I can blame dog trackers for at least 2-3 gray hairs.